Do you have concerns about getting adequate calcium with a dairy-free diet? It turns out that despite prior common belief, even though much calcium leaves a woman’s body in her breast milk, it has recently been shown that she does not need to consume extra calcium to maintain and preserve her bone health. The recommended daily intake for a breastfeeding mother is the same as other women in her age group. Sesame seeds (eaten whole, as tahini (sesame butter) and gomasio (a salt substitute containing sesame seeds, or food topper). 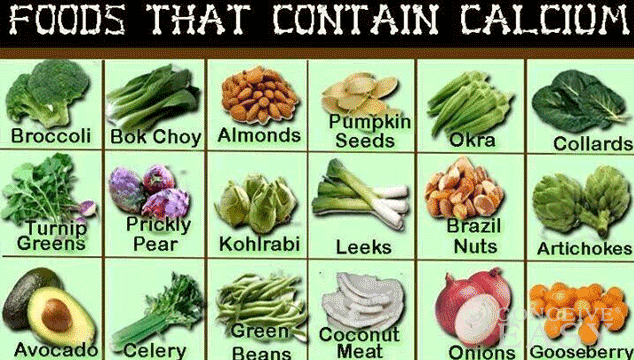 LLLI notes to chew the seeds well in order to maximize the body’s ability to absorb the calcium. Of course, there’s also breast milk itself. Breastfed babies generally always get plenty of calcium even if the mother doesn’t have enough in her diet (it’s she who ultimately suffers from inadequate calcium intake). Breast milk contains 5.9-10.1 mg/oz of calcium, 67% of which is readily absorbed (bioavailable) by the infant. For comparison’s sake, infant formulas contain 15.6 mg/oz of calcium and toddler formulas contain 24-27 mg/oz of calcium; however, the higher amounts are necessary because much less is actually absorbed and processed by an infant’s system. Whole cow milk contains 36.4 mg/oz of calcium, of which only 25-30% is bioavailable. Mothers should avoid consciously trying to lose weight for at least the first eight weeks postpartum, says Dr. Judith Roepke (a nutritionist at Ball State University in Indiana) and should instead work on establishing milk supply during this time. Weight loss drugs and diuretics should also be avoided as they can interfere with lactation ability (read about other possible drug contraindications to milk supply here). What if an obese or overweight breastfeeding mother wants to adopt a healthy weight loss plan? Expert consensus suggests she should discuss her goals with her doctor or a licensed nutritionist first. If a structured program suits her well, she may consider Weight Watchers, which offers a version tailored to breastfeeding moms. Breastmilk levels of calcium, magnesium, phosphorus, zinc, iron and folic acid are fine even if your diet is deficient. If supplements are needed, they are for your benefit — not baby’s. “[D]uring the first three months, nursing mothers don’t necessarily lose weight faster, but between months three and six, there is significantly more weight reduction when the mothers continue breastfeeding. [In one study], by the end of the first year, nursing mothers lost an average of 2kg more than formula feeding mothers who took in the same number of calories,” writes Anne Smith, IBCLC. Surprisingly, one 2009 study found that a hypocaloric, high fat diet “might promote weight loss to a greater extent” than a reduced-calorie, high carbohydrate diet in healthy lactating mothers. An average woman holds about three pounds of extra tissue in her breasts while lactating. Though many nursing moms find that pregnancy weight burns off without additional effort, some others notice a delay in weight loss as their bodies stubbornly hold onto the ‘last ten pounds’ in reaction to a constant need for extra energy resources, or their appetites greatly increase (for me, it presented as mercilessly insatiable thirst!). An average breastfeeder who eats the minimum RDA for protein can expect to lose approximately 20% of her lean tissue to cover the lactation-induced nutrient shortage (The National Academies Press). “[This 2009 study] tested the milk of Israeli women before and after religious fast days and found a number of biochemical changes in the milk associated with fasting 24+ hours. Studies in the United States by [these researchers in 1993], [this 1987 paper] and [this 2002 article] likewise showed no significant decrease in milk supply after a short fast (the women in these studies did drink water during the fast). The breastfeeding woman’s body appears to make several metabolic adaptations during short-term fasting to ensure that milk production is not affected [see the effect of water abstention here]. Usually, there is great concern about getting enough protein in a vegan or vegetarian diet. This is rarely the case in reality. I myself was vegan throughout my second pregnancy and continue to live a vegan lifestyle as I exclusively nurse my baby — who is, by the way, in the 94th percentile for weight and clearly not starved for nutrients! What mothers should actually pay close attention to is (this applies to all mothers, not just breastfeeding ones): Vitamin B12, Vitamin D (which isn’t truly a vitamin, but I digress), zinc, and fat intake. Supplements for the vegetarian nursing mother are not necessary to ensure adequate vitamins for a breastfed baby, if she eats a generally balanced diet that includes other animal products such as dairy, fish, and eggs. Vitamin B12 is a necessary supplement for vegan mothers, however. Chances are, she’s already taking a B12 supplement and would thus not need to be concerned about her breastfed child’s B12 status. As for whether supplementing a particular baby is appropriate, you may find more information on that topic here. I gained 40 pounds with my pregnancy and after delivering baby, I dropped 10 pounds and yet 30 were to off. I started drinking Mummy magic weight loss tea after two months of baby delivery and within next 8 weeks I dropped all the extra pounds.